The most anticipated and loved Disney offer is back…FREE DINING!!!! Disney Visa Card holders can book now! 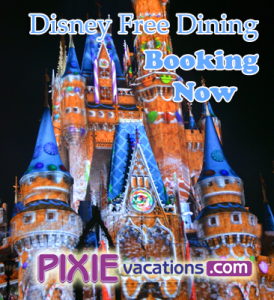 The Disney Dining Plan free at most moderate and deluxe resorts! The Quick Service Dining Plan free at most value resorts! You must stay 3 nights and buy a 2 day base ticket as a minimum. To get Free Dining and a FREE GIFT CARD on top of it email me to book your vacation today or simply click here to request a quote! Nothing beats free food and free money! ← Are We Going to See Free Dining Come Out This Fall?